Disco Night Fright is an online video slot powered by Microgaming and the game centres around a disco theme from the 70s combined with a werewolf. The game has 5 reels and 243 ways to win. Ways to win encompasses a different way of winning with slots. It actually offers 243 different paylines. With 243 ways to win players will win every time there is a winning combination and these wins will pay out from left to right irrespective of the line. What it actually means is that the symbols will act like scatter symbols adjacent to each other. The Disco Night Fright symbols include a man and a woman who will pay out 1500 and 1000 coins respectively if there are 5 on the paylines. The disco lights and the disco dancer will pay out 750 coins and 500 coins for 5 respectively. The playing card symbols, Ace, King, Queen, Jack, Ten and Nine will offer pay outs ranging from 250 to 100 coins for 5. These symbol pay outs are when playing with a bet of 25 coins. The controls are easy to use and are clearly marked and can be found at the bottom of the screen. The + and – buttons are used to select how much to bet and the coins button is to choose how many coins to bet. Players can click the bet max button to automatically select the highest bet and this will spin the reels. The spin button will spin the reels using the current bet amount. By clicking the view pays button players can view the Disco Night Fright real money pokies online paytable. The Disco Night Fright wild symbol is the shiny disco ball and will substitute for all of the symbols except for the scatter. If there is more than one wild symbol substituting in a winning combination only the highest win will be paid out. The scatter symbol is the Disco Night Fright logo and will pay out in any direction. For 5 scatter symbols players will receive 1250 times their bet, 4 scatters will pay out 250 times the total bet and 50 scatters will pay out 50 times the total bet. The Disco Night Fright werewolf free spins is activated when there are 3 or more scatter symbols. Players will be rewarded with 10 free spins. When the free spins round is activated all of the disco dancers will transform into werewolves. If 3 or more scatters appear during the free spins round players are rewarded with an extra 10 free spins. During the free spins round the werewolf will pay out 7500 times the bet for 5, 3750 times for 4 and 500 times for 3. 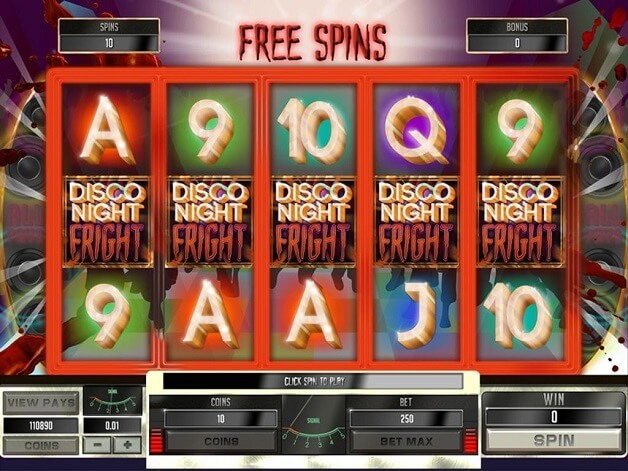 Disco Night Fright can also be played in demo mode at most online casino sites. Players can choose this option when logging into the site. They will not be asked to make any deposits or bets at this stage and will only have to make a deposit when signing up to play for real money. When playing for free players are given a certain amount of demo credits to play with and this allows them to get a feel for the game. Disco Night Fright offers a combination of 70s disco combined with werewolves. Good wins can be made during the free spins round and with the scatter wins.